The very best memories connecting us to time and place are often stimulated by the tastes and smells of our childhood. Freshly-baked bread, hot from the oven, sweet homemade jam dribbling down our chins, or the burst of flavor in each dried grapethese memories bring a smile to our faces even as they call to mind the people who made them possible. Do you remember working alongside your grandmother as she lovingly preserved garden-fresh foods to set back for the winter? You watched Jiddo (grandfather) patiently prepare his arak, but could you reproduce his efforts from memory? Are you lucky enough that they kept written records of recipes gleaned from family history and years of experience? If so, count yourself among the very fortunate minority. The reality for many of us is that we no longer enjoy such a strong connection to our culinary roots. 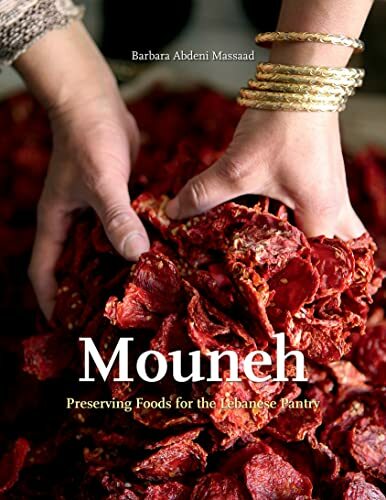 As much as we might wish the contrary, the beauty and simplicity of home-preserved pantry items, the mouneh, taken for granted during our childhood, often seems a lifetime away. In Barbara Abdeni Massaads book, Mouneh: Preserving Foods for the Lebanese Pantry, weve been thrown a lifeline to a piece of our cultural and culinary identity. So many things we would love to recreate for our own families become possible within these pages, thanks to the authors diligent research, stunning photography, simply presented instructions and delightful stories.